State lawmakers are looking at a proposal to allow the expanded use of a Hemp extract known as cannabidiol, or CBD for medical purposes. Current law only permits people suffering from intractable epilepsy to consume the product, and they can only do so with approval from a neurologist. The measure would open up the treatment to people classified with serious conditions such as cancer, AIDS, HIV and multiple sclerosis. Republican Senator Rob Schaaf of St. Joseph introduced the measure in front of a panel he chairs, the Health and Pensions Committee. During the hearing, he noted he’d sponsored similar legislation previously as a medical marijuana measure before toning down it’s language in its current form. Schaaf contends the proposal opens up options for people who have not been helped by prescribed medications. Republican Senator Bob Onder of Lake St. Louis notes CBD is a supplement which, by law, can’t be linked to medical claims that it treats a condition. He says Food and Drug Administration tests have exposed manufacturers to be dishonest. The FDA has not approved CBD products as a treatment or cure for any disease. Supporters of its use claim it’s especially effective in curbing seizures. Mara Myers heads the BeLeaf Company in Earth City, which is licensed to manufacture and sell the product. She says the current state requirement that three anti-seizure medications have to fail before patients are allowed to use CBD is unreasonable. Although the supplement is legal for those with intractable epilepsy, some neurologists don’t recommend it because of liability concerns, or because the health provider they work for won’t allow it. Schaaf said only 20 to 30 people in Missouri have been prescribed CBD. The proposal would allow doctors as well as neurologists to prescribe the oil to people who suffer from a serious condition and may benefit from its use. The maximum level of THC permitted under the measure would be increased from 0.3% by weight to 0.9%. The minimum percent of CBD allowed in the oil containing it is 5% by weight. The proposal would lower that figure to 1.5% so that smaller patients wouldn’t have to take such a concentrated amount. 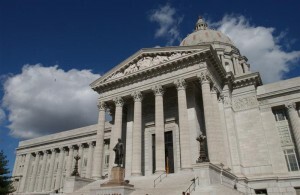 The product is regulated by the Missouri Department of Agriculture which oversees its two manufacturers within the state. During the committee hearing, which was disrupted by a move to another room, about a dozen people were present to testify in favor of the proposal, while there was one against. Kansas City resident Rebecca Means has stage four non-Hodgkin Lymphoma, while her daughter suffers from intractable epilepsy. She says current law would put her in danger of losing her children. Means said the provider her family uses won’t allow for CBD to be recommended.